The architects at Raad Studio designed this beach house to withstand rising water and hurricane winds. For the terraced decks and exterior stairs, the designers wanted a railing system with extreme durability. Furthermore, they wanted a railing that would preserve the oceanfront views. The designers opted for our Ithaca Style cable railing. For maximum strength, we used solid aluminum for the posts and top rail. The cables and fittings are 316 marine grade stainless steel. This stunning vacation home on the North Shore of Massachusetts has a unique, natural design. The home exterior mixes stone, steel, and wood and it blends in naturally with the rocky waterfront. To match this motif and to preserve the pristine ocean view, the homeowners chose Keuka Studios cable railing. We designed a Ithaca Style railing system with “Oil-Rubbed Bronze” powder-coated aluminum posts and an IPE top rail. The railing’s stainless steel cables also blend perfectly with the blue harbor water. As a result, the human eye sees right past the cables when looking out at the horizon. With direct access to the beach, this Rehoboth vacation home has incredible ocean views. To optimize access to the great outdoors, the home was built with a large patio, decks, balconies, and a ramp that leads straight to the sand. Keuka Studios designed and built cable railings for all of these applications. Because of the slender railing posts and stainless steel cable infill, the railing doesn’t obstruct the home’s pristine ocean view. In order to make the most of their beachfront property, the owners of this Jersey Shore vacation home transformed their deck into a luxurious entertainment space. The deck features a pool, a bar, and plenty of lounging space. For the purpose of maintaining the deck’s panoramic views, the homeowners chose cable railing. Keuka Studios designed a custom Ithaca Style railing system to fit the curved shape of the deck. 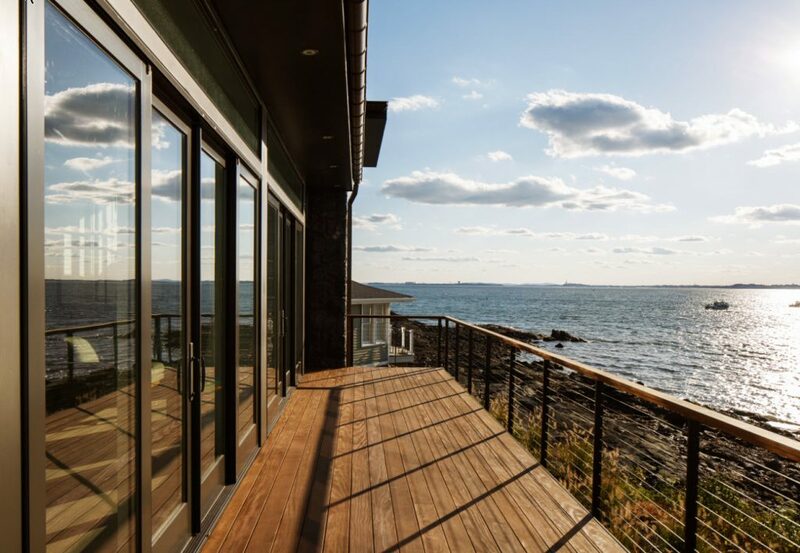 This home in Ogunquit, Maine features a deck that extends out to where the water meets the rocky shore. The homeowner wanted a modern railing system with minimal exposed hardware. To achieve this clean, seamless look, we installed our Ithaca Style railing with hidden deck fasteners. Every Keuka Studios design project is custom built for your space. To learn more about how each cable railing project moves from vision to reality, take a look at our custom railing design process. We take pride in building craftsman-quality and commercial-grade railings for interior and exterior applications.